Courgettes. They’re like children, aren’t they? (I’m guessing here, I don’t have any…children that is) One day they’re beautiful tiny darlings, all rosy cheeked with their bright little flowers shining up at you; the next day they’re hulking great terrors taking over your veg patch, devoid of any redeeming features (taste) and demanding to be fed. 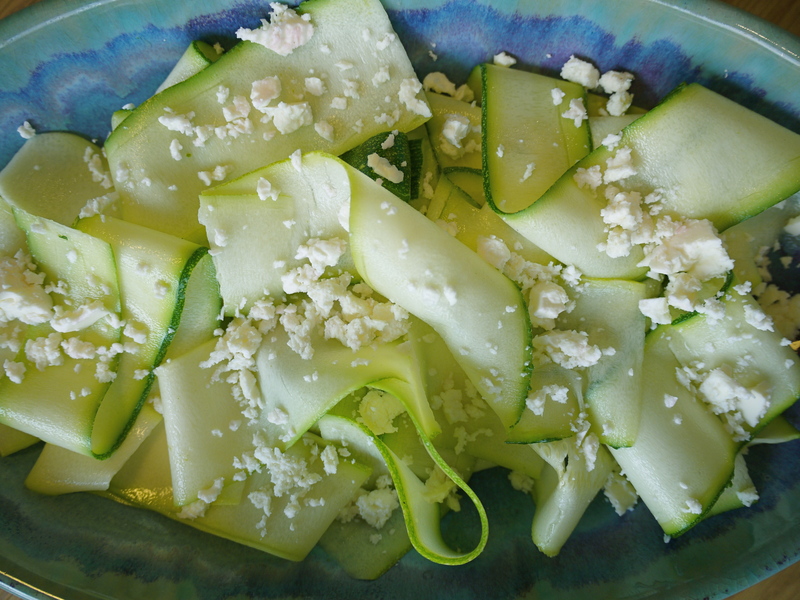 Use a speed-peeler to peel long strips down the length of the courgette creating thin ribbons. Turn the courgette when you reach the seeds and repeat untill all the flesh is in ribbons. Toss in the juice and zest of the lemon and sprinkle with salt. Leave to marinade for at least an hour to soften the courgette. Scatter with a little feta just before serving if you want to beef it up. I’m sure I will go to some sort of culinary hell for this, but I’ve created this recipe by tinkering with a Mary Berry one. I know. But, courgettes wait for no man and risks must be taken. I basically followed Dame Berry’s recipe here. However, I omitted the walnuts and added the juice of 1 lime to the mixture. Then, once it was cooked I made a lime syrup by melting 100g caster sugar in 100ml water together with the zest and juice of 1 lime. Then, as with a lemon drizzle cake, I spiked the cake and poured the warm syrup over the warm cake. I fully expect to pay for deviating from MB’s instructions, but it tasted good so what the heck. I made this at work one day as a taster for customers and it went down a treat. A goodun for party food . 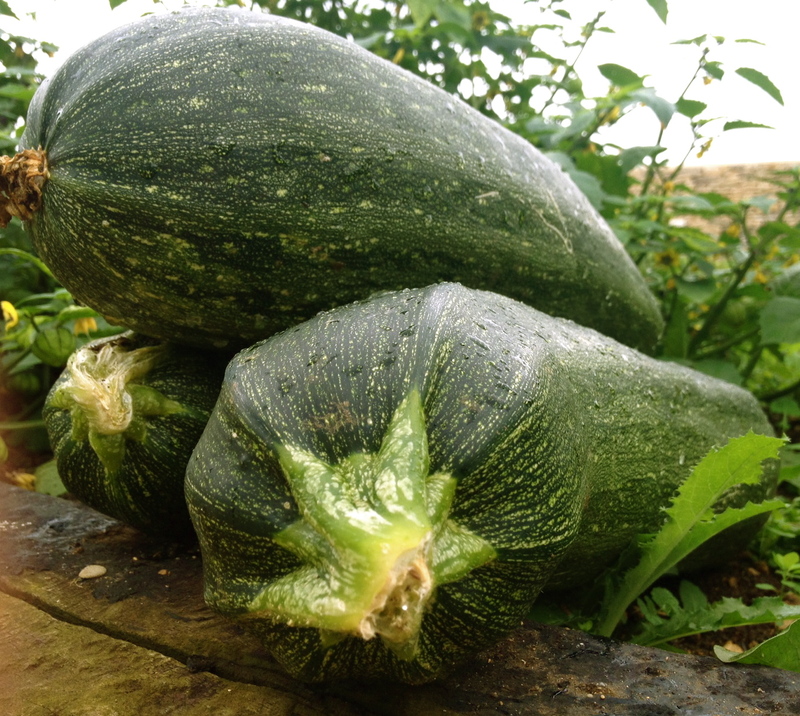 Halve the courgettes lengthways, scoop out any seeds and then slice very thinly to make half moons. Pop your pastry sheet on a lined baking tray and arrange the courgettes in rows on the pastry. Make sure there isn’t any pastry showing apart from a thin crust at the edges. Season with salt and pepper then place another sheet of silicon on top of the courgettes and rest another baking tray on the top (ie: sandwich the tart between to trays). This will stop the pastry puffing up too much. 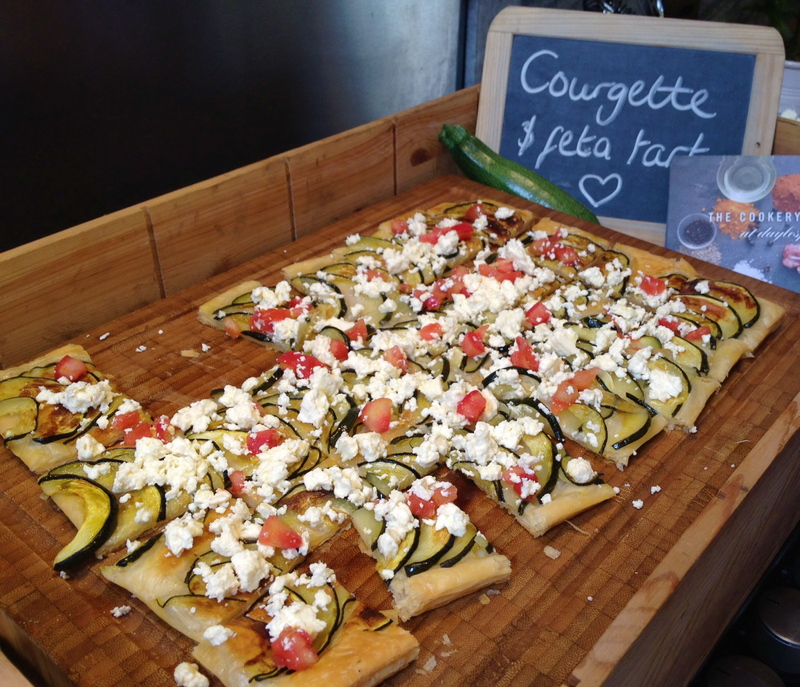 Bake at 190 degrees for 30-45 minutes depending on your oven and the moisture content of your courgettes. The pastry wants to be good a crispy and the courgettes just golden in places. Remove from the oven and carefully peel off the top layer of silicon. Scatter over the feta and tomatoes and finish with a drizzle of olive oil. Bit seventies, the stuffed courgette. But a good use for any large courgettes. Halve the courgette lengthways and scoop out all the seeds. Brush with olive oil, season with salt and pepper and bake at 200 degrees for 25 minutes. Meanwhile, make the stuffing. Sweat the shallots and garlic in a little oil until tender but not browning. Turn the heat up, add the mince, and fry until the meat has a few brown crispy bits. Next add the puree, wine, oregano, lemon zest and some seasoning and leave it to bubble away until it has reduced to a glossy sauce. 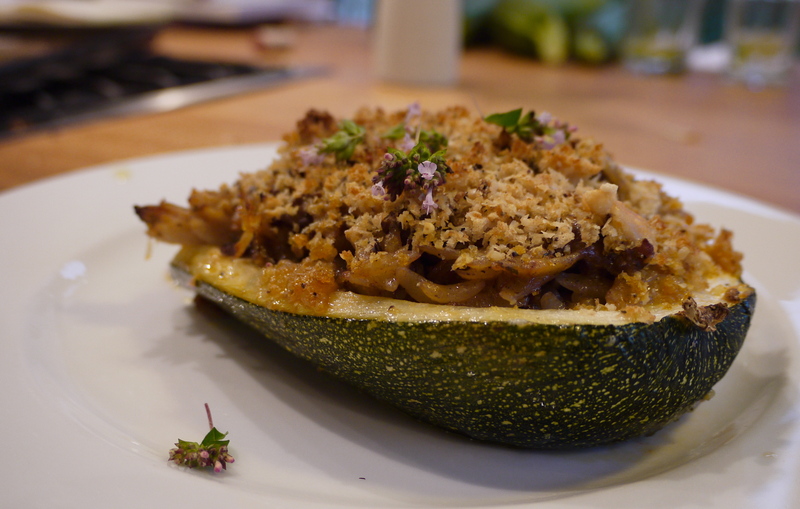 Remove the courgettes from the oven, stuff the lamb sauce into the courgettes and top with a mixture of the the parmesan and breadcrumbs. Return them to the oven for a further 10 minutes, or until the crust is golden brown. Thank you, brilliant! Courgette inspiration is just what I need! 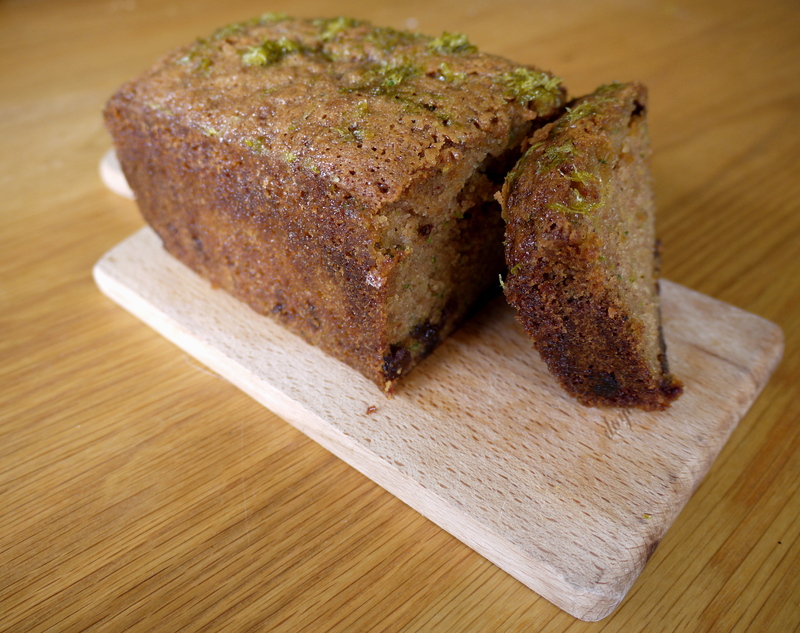 I was going to say that the courgette and lime cake looks and sounds very good – but that might implicate me in the whole Mary Berry recipe tampering scandal, so I won’t… I will be trying your recipe though, if you promise not to tell anyone! Always grateful for new courgette recipes. Especially when there seem to be courgettes lurking everywhere in the garden at the moment. So many that I’m also tempted by that daring lime and courgettes cake deviation.